I’ve officially stopped using my Curology prescription after about a month of weird breakouts and skin texture issues. Now is the time, then, to reintroduce acids into my routine. I’d purchased two gifts for my little sister for Christmas and then found out that she didn’t need them. When I went back to Sephora to make the return, I saw the Drunk Elephant AHA kit on the shelf and thought, “Nah, that’s waaaaay too expensive”. Turns out, though, that after I returned the products I bought the sticker shock wasn’t too bad. So I picked it up and started using it. The first couple weeks, not a whole lot happened. That’s because not a whole lot was happening with my skin. Generally, that’s an awesome thing, but when I’m testing acid I like to have at least a little bit of trouble going on so I can actually tell whether a product is effective. Lucky for me, Christmas happened. I’m mildly lactose intolerant, and my daily diet includes almost no bread, but over Christmastime a lot of fabulous food (and fabulous ice cream) happens, and right after the holiday my skin said to me, “what on this entire planet have you been doing to yourself you are literally made of garbage right now.” And then my skin went to crap. 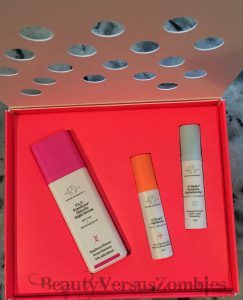 The kit itself contains three items: the TLC Framboos Glycolic Night Serum, the B-Hydra Intensive Hydration Gel, and the C-Firma Day Serum. The Night Serum is full size at 30 mL, and the other two are deluxe samples at 8 mL each. The AHA kit is listed as a “complete AM/PM regimen”. Obviously if you’re following a Korean skincare routine in any way, shape, or form, this is not true. For a product that’s fairly expensive, the packaging here is great in some ways and only okay in others. It’s made of plastic – very obviously made of plastic. If I’m paying premium prices for a product, it should both perform like a premium product and be packaged like one. I wasn’t particularly impressed on this front. The cap itself twists to pop a pump out of the top of the bottle. This is great because you never have to worry about losing the cap, or about the product accidentally spilling in a bag or your suitcase or whatever. I found that one pump gave me enough product to cover my entire face, so that was well measured. The Night Serum is a moderately watery liquid. It smooths over the skin easily and absorbs pretty quickly. I feel that the results I got were pretty decent – exactly what I was looking for in an AHA exfoliator. It didn’t trigger any breakouts. It also didn’t irritate my skin or dry it out. It actually almost felt a little moisturizing. This product on its own retails for $90 at Sephora. If you aren’t a Sephora person, you can get it for the same price on Amazon. To be frank, this is a good product but I don’t love the price point. I think it’s highly likely that I can get the same percentage of AHA in another product for significantly less money, and I will be looking into it. What I got in the AHA kit is obviously a deluxe sample and not the full-size product. So the packaging I have is likely different than the full-size would be. That being said, this is another plastic bottle with a pump top. The deluxe sample is a regular pump top with a removable cap rather than the twist-up of the Night Serum, but looking at pictures on Sephora it seems that the full-size has the twist-up version. If that’s so, I’d have the same complaints and compliments for this product as I did for the Night Serum. This is a gel moisturizer. It looks a little cloudy, but does not leave a cast of any kind when applied. 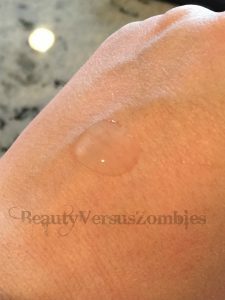 It’s a basic gel moisturizer – it does its job without any frills, but it doesn’t exceed the abilities of some gel creams that you can find for much less money (like, for example, the Mizon Snail Recovery Gel Cream). Ingredients: Water, Butylene Glycol, Glycerin, Ammonium Acryloyldimethyltaurate/VP Copolymer, Ananas Sativus (Pineapple) Fruit Extract,Arctostaphylos Uva Ursi (Bearberry) Leaf Extract, Citrullus Vulgaris (Watermelon) Fruit Extract, Lens Esculenta (Lentil) Fruit Extract, Pyrus Malus (Apple) Fruit Extract, Panthenol, Sodium PCA, Sodium Hyaluronate Crosspolymer, Sodium Lactate, Dipotassium Glycyrrhizate, Cyclodextrin, Trisodium Ethylenediamine Disuccinate, Citric Acid, Pentylene Glycol, Chlorphenesin, Caprylyl Glycol, Phenoxyethanol. 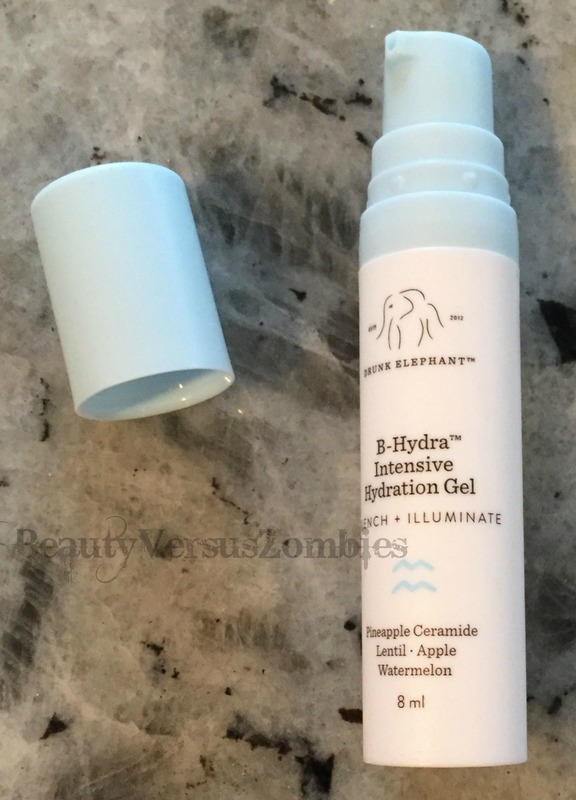 A full size bottle of the B-Hydra Intensive Hydration Gel costs $52 on Sephora or Amazon. 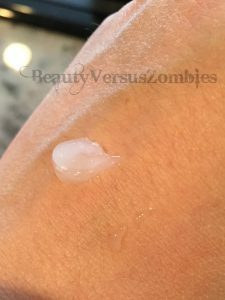 What I got in the AHA kit is obviously a deluxe sample and not the full-size product, just like with the moisturizer, and the same analysis applies here. The sample has a removable cap, but I think the full-size product has the same bottle style as the Night Serum. This product smells bad. I’ve reviewed products where I didn’t like the smell before, and in some cases I continue to use them. I won’t be doing so in this case. 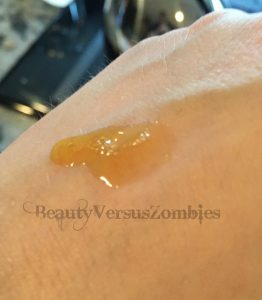 This is an okay Vitamin C serum, but it also feels a little bit sticky. It’s almost like it leaves a tacky consistency on my skin, and then when I go to apply something else on top it gets all muddled and unpleasant. Ingredients: Water, Ethoxydiglycol, Ascorbic Acid, Glycerin, Laureth-23, Lactobacillus/Pumpkin Ferment Extract, Sclerocarya Birrea (Marula) Seed Oil, Ferulic Acid, Sodium Hyaluronate, Algae Extract, Camellia Sinensis Leaf Extract, Lactobacillus/Punica Granatum (Pomegranate) Fruit Ferment Extract, Glycyrrhiza Glabra (Licorice) Root Extract, Vitis Vinifera (Grape) Juice Extract, Phyllanthus Emblica (Indian Gooseberry) Fruit Extract, Hydrolyzed Wheat Protein, Tocopherol, Caprylhydroxamic Acid, Acetyl Glucosamine, Hydrolyzed Quinoa, Glutamylamidoethyl Imidazole, Dipotassium Glycyrrhizate, Tetrahydro Curcuminoids, Sodium Hyaluronate Crosspolymer, Glycine, Sucrose, Maltodextrin, Propanediol, Caprylyl Glycol, Sodium Hydroxide, Phenoxyethanol, Xanthan gum, Hydroxyethyl Acrylate/Sodium Acryloyldimethyl Taurate Copolymer, Isohexadecane, Polysorbate 60. 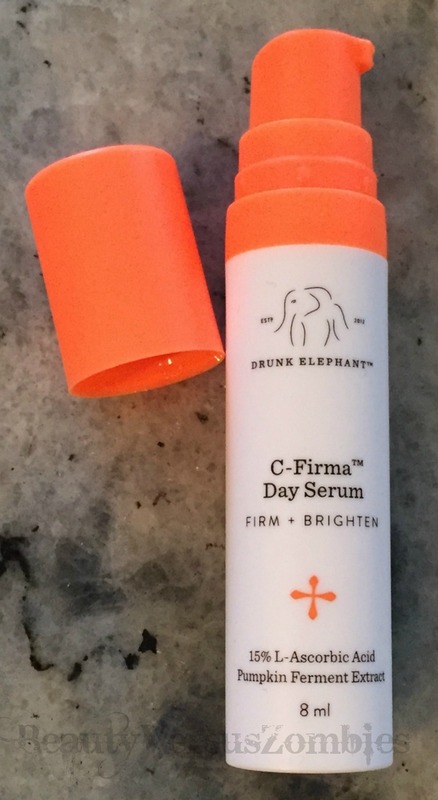 A full size of the C-Firma Day Serum costs $80 on either Sephora or Amazon. Even if this product had no other issues, for $80 it shouldn’t stink. For that reason alone I would never purchase a full-size bottle. Now generally speaking, I try not to spend too much money on any one skincare product. Unless it’s total magic, I’d rather test out things to find cheaper substitutes. Hopefully I’m going to be doing my skincare for a very long time, so I’d rather have an effective but inexpensive product. That way I can also do things like, you know, pay rent. 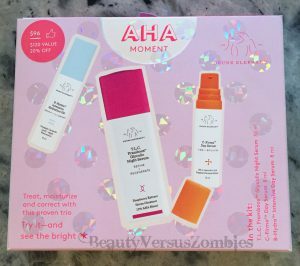 This AHA kit is expensive – it retails for $96 at Sephora. That is not chump change and it’s not the kind of money I want to spend on the regular for one item. On the other hand, if you want to explore the brand and you know you will love the Night Serum, there’s no reason not to spend the extra $6 to get deluxe samples of the C-Firma and B-Hydra and see if you like them as well. I will absolutely not purchase full sizes of any of the samples here, and I will not repurchase either the kit or the full size of the Night Serum either. I just don’t think they are worth the money for me. This entry was posted in AHA/BHA, Drunk Elephant, review, Sephora and tagged review, skincare by BeautyVersusZombies. Bookmark the permalink. From your description – and, in part, based on the ingredient list – the night serum sounds a little like the CosRx AHA liquid. Which has worked pretty great for me, and is a whole lot cheaper. I love both the Mizon 8% AHA and the Papa Recipe 8% AHA. I would never in a million years pay $90. I can’t even find anything on the ph of the product. AHAs and BHAs have to be at a low enough ph to even be effective on the skin, but I can’t find anything saying that Drunk Elephant’s products are.